Are you looking for something different to make this holiday season? Something besides chips and dip? The ever popular cheese and sausage tray? Well, do I have a treat for you! 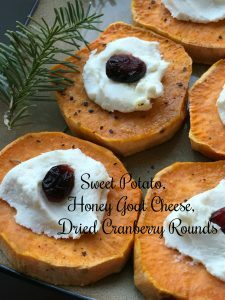 Even though I have absolutely nothing against chips and dip, and I love me some good cheese and sausage, it’s always nice to see something different on the appetizer table and with so many health conscience people and diet restrictions, it never hurts to see a somewhat health, good-for-you, appetizer alternative. Goat Cheese or Cream Cheese? This recipe doesn’t call for a lot of ingredients, six total. 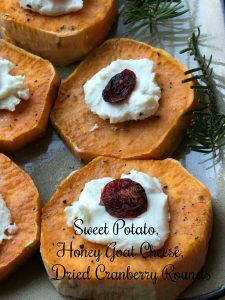 One of the ingredients is honey goat cheese. Personally, I love goat cheese but there are many people who don’t. One solution would be to substitute honey cream cheese or another substitution could be mascarpone cheese. Either or would work beautifully in this simple yet delightful recipe. Arrange the slices in a Christmas tree pattern for a festive look. Start with one at the top, then two, then four and so on, until you have the shape of a tree. I decided to peel my sweet potatoes first but you can surely skip this step if you like. Just make sure to scrub the sweet potatoes with a potato brush first to make sure your potatoes are good and clean. I sliced mine slightly thicker than 1/4-inch slices also. A delicious and tasty appetizer alternative. Spray a rimmed baking sheet with non-stick cooking spray or line with a sheet of parchment paper. Lay the slices out on the baking sheet in a single layer, spray the tops lightly with more non-stick cooking spray. Place pan in the oven and bake for 15 minutes, flip slices over and bake for another 12-15 minutes or until tender. 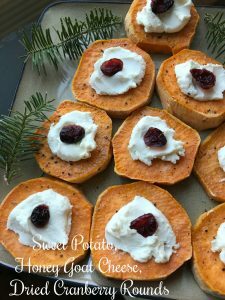 Spoon 1/2 teaspoon goat cheese onto each sweet potato round. 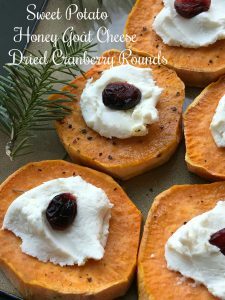 Top goat cheese with a dried cranberry, drizzle with honey.